Elders take Curries hot and spicy,actually we enjoy them.But this item is for kids who cannot enjoy hot and spicy food,and also for elders who take less spice. Take off the skin and chop into 1 inch pieces. Firstly pressure cook the Anapakaya mukkalu with2 glasses water,n salt up to 2 whistles.After cooling remove from cooker.Drain the water. Place a kadai on the stove,add oil,after heating add urad dal,red chillies and green chillies made in to pieces.Mix well.add the boiled anapakaya ,to the kadai,mix well.Then add half cup milk,and sugar to the curry.Lastly sprinkle the rice flour on the curry. 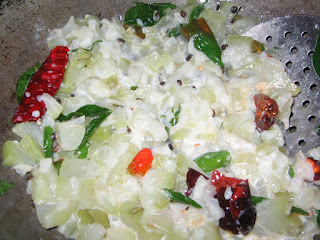 (pindi pettadam antaru kada).Again mix thoroughly. Keep in a low flame,and let the curry cook for 3 mins,switch it off. Adding of curry leaves is an optional. Can be eaten with rice.